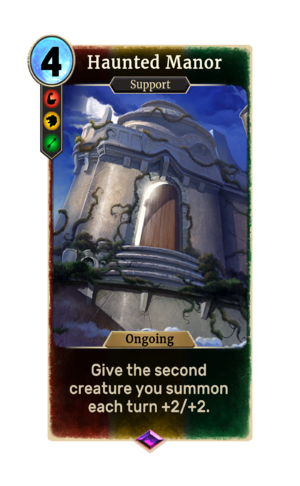 Haunted Manor is an epic House Hlaalu support card. It is part of the Houses of Morrowind expansion. The card's ability applies the Haunting card effect. The card's magicka cost was increased from 3 to 4 in patch 1.72.4. The card depicts the St. Olms Haunted Manor, which first appeared in Morrowind. This page was last modified on 7 October 2018, at 16:02.